Why we're considering moving abroad. Growing up an hour outside of New York City, I’ve always dreamed of what it’d be like to one day live in the Big Apple. But I quickly learned upon graduating college that moving here would not be easy. The reality is: Rent is expensive. But it’s not just in New York (although it does have some of the highest rent prices nationwide); throughout the US, the amount needed to lease a place to live can take out a hefty chunk of your paycheck. So, I’m expanding my horizons: How much could I stretch my intended rental budget of $1,500 in other parts of the world? One thing I’m fairly certain of when it comes to living in a city like New York is that I’ll have to live with roommates. In many major metropolitan areas, high costs of living have given way to more people opting to live at home, or with multiple roommates, who sometimes even sacrificing room size to divide up the cost of rent. Home affordability in the United States has dropped substantially over the last 10 years according to Zillow, due to the housing boom and bust cycles that took place in the mid-2000s. Not only have prices increased significantly, but there are also fewer homes for sale, and lending standards are more restrictive—which means whether you’re looking to rent or buy, your budget now might have to be significantly higher now than it would have been a decade ago. As of July 2018, Zillow reported the average rental listing price for a one bedroom in the United States at around $1,299. Moreover, in the US, a recent study conducted by the National Low Income Housing Coalition, noted an alarming discrepancy between the money needed to afford rent, and average national hourly wage. Basically, the study proved that on a national level, many people simply can’t afford to live alone—even if they’re just renting. It doesn’t paint a rosy picture for a semi-recent grad like me looking to move out and find a suitable place for myself. But what about internationally? Do the same statistics apply? Are some cities and countries more efficient when it comes to cost of living? Is it time that millennials look beyond the US for cities that will offer job opportunities, adequate living wages, and affordable housing? Check out these 11 cities and see what we found. Metrics matter. The same asking price ($1,500 per month) can be a very different rent per square foot. In human terms, NeighborhoodX explains that this means that the same rent can sometimes be a tiny studio or an entire house. Rents per square foot vary greatly across a city’s neighborhoods, just like asking prices will range significantly. Each sample property highlights our specific targeted price point along the pricing spectrum in that city, though it can vary greatly based on specific neighborhood location. Renting does not equal throwing your money away. Paying over a thousand dollars a month just to have a roof over your head may seem like you’re wasting hard-earned cash, but it’s actually a great option for those who aren’t quite ready to take the leap into homeownership. Plus, these statistics only scratch the surface of characteristics that play a role in determining housing pricing. No matter where I go I always get homesick…glad to be back. On one hand, even in Manhattan, for those willing to go a bit uptown, this Hamilton Heights one bedroom offers 750 square feet for $1,400. On the other hand, not too far from there is a 250 square-foot studio (which by the way, is roughly the size of a parking space) for $1,600/month. But if one is willing to venture outside the island and go deep into Brooklyn, this Gravesend two bedroom place offers 1,600 square feet for $1,600. When it came to analyzing the rental properties available at the set budget here, the inventory was significantly more challenging to find, even in comparison to high-priced New York. “It makes sense given how compact the city is, and the relatively smaller size of the overall housing stock,” says Valhouli. But speaking of small, $1,595 will get you a 192-square-foot. studio in the Tenderloin area. To put this into perspective, this is the size of a small parking spot, or in some cases, a large walk-in closet. But it does have relatively new finishings, so you’re paying for those as well. LA has a lot to offer, and Valhouli says that recently, many creative professionals have been priced out of the Bay Area and are making the move to LA instead. For comparison, he found that $1,500 gets you a 600-square-foot studio on Sunset Boulevard in the Echo Park area, which is a decent sized space in a decent location. Moreover, “In the valley, there has been an increase of single family residences creating ADU’s (Accessory Dwelling Units) in their garages and backyards,” says Michelle Schwartz, Agent, Founder of The Agency in Los Angeles. “The cities purpose for providing these permits easily and accessible is to offset the lack of affordable living throughout the city. We have seen homeowners rent out these ADU’s which are typically around 400 square feet that include a full kitchen and bathroom for around $1,500 a month,” Schwartz explains of the LA market. So even though LA is in the state with the least affordable housing, there are options for scoring a decent single-person-sized space. Valhouli found that in most of the other cities, $1,500 puts one at the lower end of the rental scale. Of course, there are compromises to be made, such as longer commutes, living underground, living in a place the size of a walk-in closet, or living in an actual walk-in closet. However, in Chicago, $1,500 puts you into one of the smaller units (418 square feet) in one of the nicer rental buildings, with actual space and amenities. Actually, as Valhouli notes, it’s twice the space (so half the price per square foot) of the one in San Francisco. $1,500/month gets you a 501-square-foot studio in the diverse, middle class Takoma Lake area, north of the Potomac river. “It’s not too much more expensive than the place in Los Angeles, but it is half the price (on a per-square-foot basis) of the place in San Francisco,” says Valhouli. Moving abroad might seem extreme in the hunt for more affordable housing, but who knows? Different countries have different housing markets and economies, as well as cultural offerings. The NeighborhoodX team converted all European prices into USD, as well as square meters into approximate square feet, to find out if the mighty dollar might get farther in these cities across the globe. $1,500 gets you a 430-square-foot. studio in Stadsteel Westpoort, an industrial Amsterdam borough just north of the central city, that features an outdoor balcony deck and modern kitchen, but requires a Murphy bed for sleeping space, so you win some you lose some. In the kind of housing market that makes one nostalgic for the privacy of the 192 square foot studio in San Francisco, Valhouli found that there is a shared room in the central district of Beijing available for around $1,500, but little actual rental property available within that price range. Beijing has seen a serious spike in rental pricing recently, making it difficult options more limited than any of the other cities we investigated. 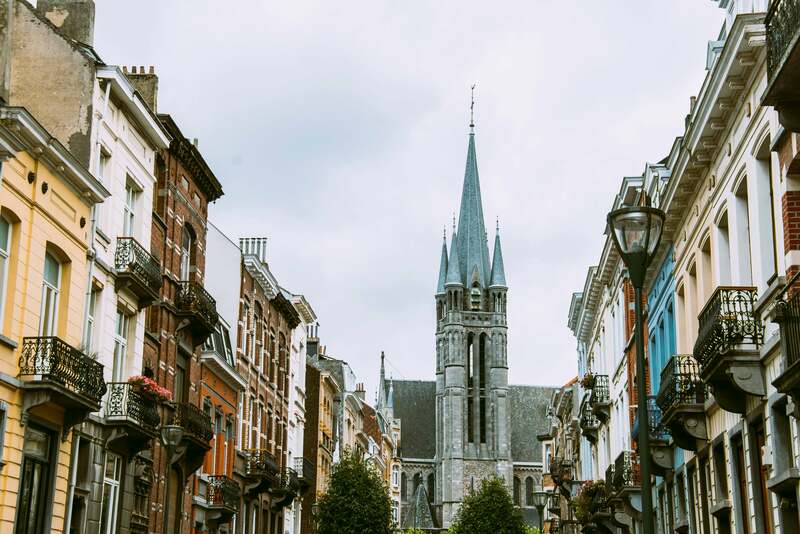 Brussels offers perhaps one of the best bargains on this list; $1,500 rents a rather nice two-bedroom apartment in a good location, as well as the second largest overall sized space on this list. This one clocks in at 1,184 square feet (which is almost six times the size of the studio in San Francisco for the same price). In London, the set price would rent you a room in a shared apartment (sorry, “flat”) in the busy, skyscraper-filled financial area of Canary Wharf. Though the room comes furnished, it’s a lot to pay for just a bedroom in an apartment. That leaves a lot to be desired in this city across the pond. A centrally located but compact (301 sq ft.) a one-bedroom apartment can be scored in Sweden’s biggest city. Pricewise, Stockholm seems on par with New York City, Valhouli found, but you’re getting the better location here, as opposed to having to move the outskirts of NYC. And last but not least, just across the water from Sydney, in North Sydney, you might end up having to pay more than a pretty penny for a nice place. Valhouli and his team found an incredible view from a four-bedroom apartment—but there’s a catch. Australian rent is listed by week, so while this sweet space measures 2,100 square feet—the largest on our list— your $1,500 will only get you a one week’s stay.